A young girl discovers surfing and love (in that order) during one transitive summer. Gidget finally gets married and rebels against the social caste system in her new husband's company. Shady stockbroker and abusive husband Gerald Parker is found dead in the penguin pool of a NYC aquarium after being knocked cold by his wife's boyfriend. Younger generation vs. "older" folks on vacation at an Italian villa. Nicky and Tacy are going to be married. Nicky wants to save up money for a house, but Tacy dreams of starting off with their own home on wheels--a trailer. Q: What is 'Gidget Goes to Rome' about? 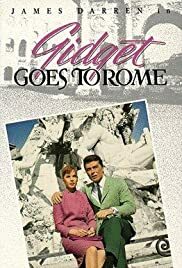 Q: Is 'Gidget Goes to Rome' based on a book? The one thing I enjoyed was the scenery and fashion show sequence.Carol Carol is a lousy actress, and the "gang" are as equally uninteresting.James Darren is a gorgeous italian and I love his songs!